I was a little nervous as I am a smaller size top than bottom but I got it in a 4 anyways and the shorts are stretchy! 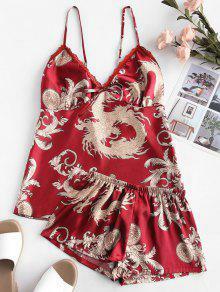 Love the print because I also have a dragon tattoo and the satin material is so silky. Super cute! Sizing is really off, I’m normally a UK10, which would be a medium, but I got a 2xl and it fits, and the pants are actually small. I love it though, super pretty. I am usually a AUS size 10 and I ordered a M and the shorts were very snug I suggest size up. Looks like pictures.